Oh yeah Loca, let us not forget how she would write her name with his last name over and over. Sociopath's can be very charming. Here is a list of ways to identify a sociopath. This list is from "Profile of a Sociopath". Is is a pretty good list of sociopathic indicators. I'm listening to INSession on TV.....they just showed a little snippet of Baez.....he said that if Caylee had been of any other race, instead of being white, no one would have heard about this case, it wouldn't be in the media. Uhm, excuse me? Not reporting your child missing for 31 days hits the media no matter what your race is. Baez is such a putz! He said something like.....There are many missing children but this child got all the attention,(slight pause) and rightfully so. Sound familiar? And the reason this story got all the attention is because Casey, not Caylee, is young, pretty and white. Get a clue Baez, America is not made up of totally ignorant people. The defense was focusing on Casey's allegations of abuse. Her boyfriend, Anthony "Tony" Lazzaro, told her lawyers that Casey said her father George had physically abused her. He did not remember her saying it was sexual in nature, as Casey later claimed in a letter to her jail pen pal. I think I can most unfortunately speak to many people that have been abused in their childhood, whether that be emotional, physical or sexually OR any and all combined. IMHO, that is NO excuse whatsoever for stealing, lying and certainly not murdering an innocent baby girl. Casey had an option as a 21 year old girl, she could have saved her money (had she gotten a full time job) & made arrangements to live elsewhere with her child...that is not what she did & she knew the difference from right and wrong, I have no sympathy for her whatsoever in this regard. I understand what it is like to live in those conditions but it was up to her to make a change for the better, she chose not to. As stated so many times by myself and others before, at best the only thing the defense can hope for in this regard is to spare that miserable skank's life by lethal injection. Byea$$ is attempting to play the race card...he thinks he's in the same league with Johnny Cochran...NOT! gypsy amen to that! she stole from everyone except tony!! and his friends!! doesnt mean she wouldnt have with more time and trust. I don't think that Tony had anything to steal. But I think I remember reading that Casey ran up Tony's bar bill at Fusion? That he was given X amount for drinks while working, and Casey went way over on his limit??? I'll see if I can find a link to this......so at this time MODS.....this is jmoo!! Thanks Boo for refreshing our memories with the signs on how to recognize sociopath behavior. I know early on this was discussed. With each passing day we have witnessed more and more of her actions fit the profile. Rick Plesea, Cindy's brother, made it clear in his OCSO LE interview that Cindy was THE PRINCESS in their family & ruled over all her brothers (seemingly to the point of emasculation) just as she does George. so I guess it carried on to her family. 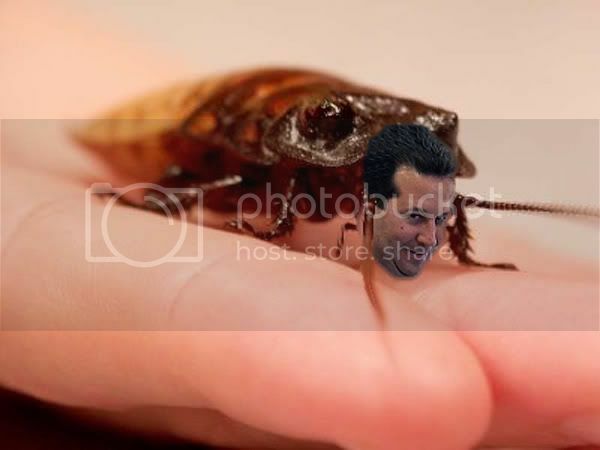 Nope....but a Jose Cockroach he is!! oh that would be an interesting read if you can locate it!! maybe tony and roomates had checkbooks/debit cards and credit cards no? You are so right Samarie. Now, he's playing the race card!!!! He's forgetting that an Hispanic woman (ficticious or real) was accused by the defendant of abduction. Caylee's case hit national attention because the defendant is scum & her mother went on national TV with her @$$hat of an attorney lying their faces off! duh! no one would have known of her white or not! had he not wanted to play the race card! saying he was the first hispanic to try a case of this magnitude! HE put himself on national t.v with his other infamous kick gerlado rivera! baez was all over the news! giving news conferences etc etc. Sure, it's possible.....she may have found out that there was really nothing in the accounts....or she was just waiting, she had to feel these people out so as to know what crap to pull on them. Who knows, maybe it was the one bridge she didn't feel like burning yet, she needed a place to stay, her family didn't know about Tony so no way to track her down (Yay Amy), maybe she thought she would eventually end up in NY with TL. she had to stay elsewhere. Maybe he didn't trust her. I'm starting with Tony's depo first and just barely into it.....he can't seem to remember a lot, due to how long ago this all happened. Yikes! I'm sure too Samarie, and it's working with the one person that spent the most time with Casey during those 31 days. At least so far....even Tony tells Baez these questions could have been answered if he had been questioned about them much earlier. I have a feeling that LDB can get Tony to remember quite a bit tho!!! I'll be reading the depos with following the defense questions to him in mind. I think we will get a more well rounded memory when the State has them both on the stand first in their case-in-cheif. Still taking his cues from Casey. "They just want Caylee back. That is all they are worried about right now is getting Caylee back" hesitates then adds as an afterthought "And you know what, that's all I am worried about too!" Thanks Seeme.I have power back on again and depositions! I don't think I could ever forget. Page created in 10.222 seconds with 20 queries.